Over time, users tend to have more and more accounts with various Internet services which can end up being a massive problem if you do not have good memory or always repeat the same keys, and this could jeopardize your privacy. If you want a foolproof system, that ensures that you always have your passwords and don't have to keep repeating the same keys, we can use Any Password, a complete manager for all user accounts, which offers security and ease of use. One must remember a password to access the information of all the accounts that we have on the Internet. 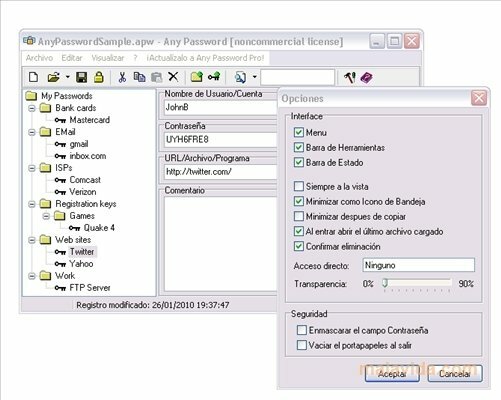 The program has an encryption system by AES/MD5 algorithm, a secure password generator and a clear interface, ideal for the type of application in question. If you want a practical and secure password manager that is also totally free, do not hesitate and install Any Password on your PC. Works on Windows XP only.